Posted on January 28, 2014 by Bill Stegemueller | Comments Off on What’s Weighing You Down? Not the colorful character from the DreamWorks movie… but the sheep. Shrek disappeared from his ranchers six years ago. He was later found in a cave. His fleece had grown out of control. 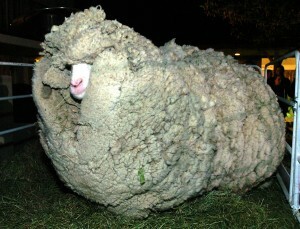 Normally a sheep is sheared at least once a year. When they finally caught up with Shrek and sheared him, his fleece weighed in at over 60 pounds! Jesus said in John chapter 10, “I AM the Good Shepherd,” and goes on in that chapter to say that His sheep know His voice. Sometimes we can be like Shrek and wander away from our Shepherd and do our own thing. Inevitably life begins to weigh us down and before long we become overwhelmed and life gets out of control. It’s like we’re carrying around a 60 pound fleece! Hebrews 12:1 challenges us to, “lay aside every weight, and the sin which so easily ensnares us, and let us run with endurance the race that is set before us.” We can’t do that weighed down with a heavy fleece. What a warm invitation. So often we foolishly carry around burdens Jesus doesn’t want to us to carry. A shepherd would typically sheer his sheep once a year. I don’t know about you, but I need to be sheered daily. Let’s come to Jesus… the Good Shepherd and allow Him to sheer us… DAILY of all the excess baggage that we often carry around. More about this next month….